Interesting …..i have Expo 58 on my TBR ( of course!) ….i really enjoyed The Rotters Club …..really must give this ond a try . Hope you enjoy Expo 58, Helen. This one’s particularly good on the horrors of Thatcher’s Britain and many of these issues remain relevant today. I read this years ago and really loved it. Your review makes me remember why I liked it so much. It’s great – I thoroughly enjoyed it, Ali. Glad to hear my review reminded you of this wonderful book. Great post, Jacqui.Glad you enjoyed it. Great clarity. I could just scratch the majority of what I’ve written and direct people here. Now off to “marshall” myself and actually finish writing my own post, or perhaps one of my posts, as the novel does cover a lot of ground, in many different ways. Many thanks, Seamus. No, you mustn’t scratch what you’ve written as I’m sure you’ll have plenty to bring to the party! You’re right, there’s so much ground to cover as each of the Winshaws warrants a mention. And then there’s Michael’s story, so much to say there too. Looking forward to reading your post later today. Thanks, Seamus. I enjoyed reading your review this morning! Haha! Thanks, Karen. This is a fabulous book though, and it might make a good change of tone between those Russians you like to read! Speaking of which, I have Chekhov’s In the Twilight collection in my TBR, and I’d like to get to it sooner rather than later. I hope you do – I really loved it! I haven’t read this in so long, but I remember really enjoying it. Your review has convinced me for a re-read during the festive season! That’s great! I hope you enjoy it just as much the second time around. This sounds so full of interesting characters and plot developments. A “find the culprit” kind of ending actually sounds perfect for a book like this. Thanks, Brian. There’s quite a lot of plot here, but it rattles along, and it’s thought-provoking with it. A great book with some very unlikeable characters. The final section is excellent, very fitting, and there’s a sense of closure for the Winshaws. Hello Jacqui: I didn’t read your review until I posted my own for the obvious reasons. It’s such a complex novel, I knew we’d all have a slightly different take on it. BTW have you seen the film What a Carve up? It’s a brilliant novel, so much to cover in one post. I’ve just read your review and it’s terrific! No, I haven’t seen the film yet. I thought I’d wait until our reviews went up. Looking forward to it though. I absolutely loved The Rotter’s Club and everything I’ve heard about this novel makes me think I’d love it too – especially now you mention how many vile characters there are, you know how much I like an unlikeable character or six! Well, there’s a very good chance that you’ll love this one, Naomi! The Winshaws are a hideous bunch, but Michael and two or three other characters help to balance things out. I think you’d enjoy the political satire, too. Jacqui, you’re getting as bad as Guy for my TBR, so I enjoy when you read the same book: only one additional book to the pile! Joke aside, your review is great and makes me want to read the book. It sounds like a fascinating and engaging novel. You need to be an excellent writer to combine mystery, a political message and the story of an influential family. Haha! Well, that’s one benefit of doubling up on a book. It’s been fun to read this novel alongside Guy and Seamus, and like our readalong of The Good Soldier, we’ve all approached the book from slightly different angles. 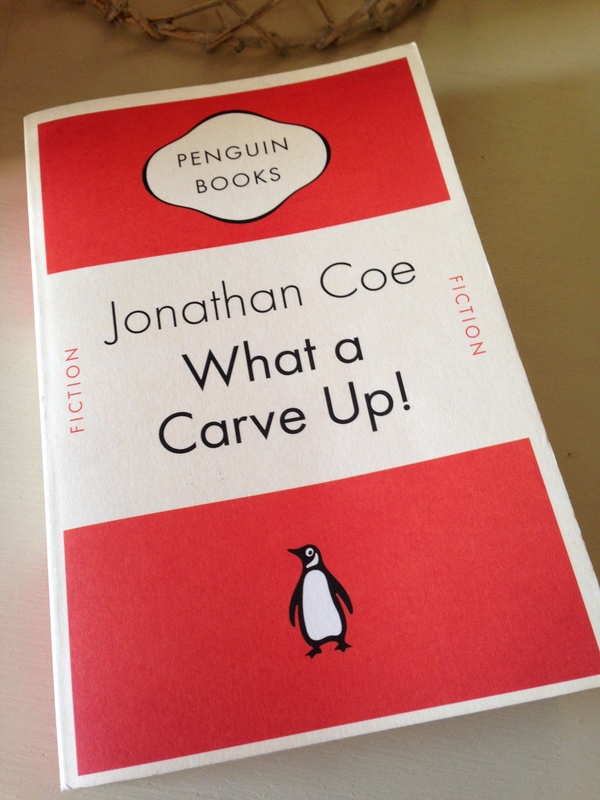 I really enjoyed Carve Up! It’s ambitious, entertaining, thought-provoking and very cleverly constructed. You’re right, the combination of narrative threads demonstrates Coe’s skill as a writer, and he switches between different forms and styles, too. Quite an achievement. Have you read any of his books? The Rotters’ Club is another popular one. Although I don’t read a lot of comic writing (not sure why) I have encountered Jonathan Coe before, enticed by his love of (and indeed book on) B. S. Johnson. It was The Terrible Privacy of Maxwell Sym (largely because it was leant to me) and it wasn’t terrible. This sounds like one to try if I fancy some more. Possibly his best? Carve Up might well be his best although The Rotters’ Club seems to be very well regarded. The only other one I’ve read is The House of Sleep (which I recall enjoying very much) but as it was several years ago, the details are a little hazy now! This is definitely ripe for a re-read for me – I read it many years ago when the paperback first came out. Coe is one of my favourite authors. Fab – I think this would be a great one to reread as there’s just so much in it, and many of the sociopolitical issues remain relevant today. I have an unread copy of The Rotters’ Club so I think that’ll be my next by Coe. This has been sitting on my shelf since about the time it was published. In fact, I just last week added it to a pile of books I’ve been preparing to put in The Black Hole, a flat area forming part of the gate to our apartment building, where one can place almost any object only to have it mysteriously disappear, usually within the hour. I guess I’ll pull it out of the pile. My copy had been sitting on the shelf for about five years, but I’m glad Seamus suggested a readalong as I probably wouldn’t have picked it up otherwise. It might well have ended up in the holding bay for charity shop / library donations, and I’d have missed out. It’s a lot of fun and very cleverly constructed. Have you seen Guy’s review? It made his best of 2014 list. I read this years ago and liked it, though didn’t love it. You capture it well though. Have you read Iain Banks’ novel Complicity? It covers very similar territory so it’s an interesting companion piece. I have read Complicity, but several years ago so the details are quite hazy. I liked it but didn’t love it (a little like your experience with the Coe). Can’t put my finger on it right now, but something about Complicity (possibly the lead character?) left a bad taste in my mouth.